Hello Katie Girl: Unleash the Hounds! 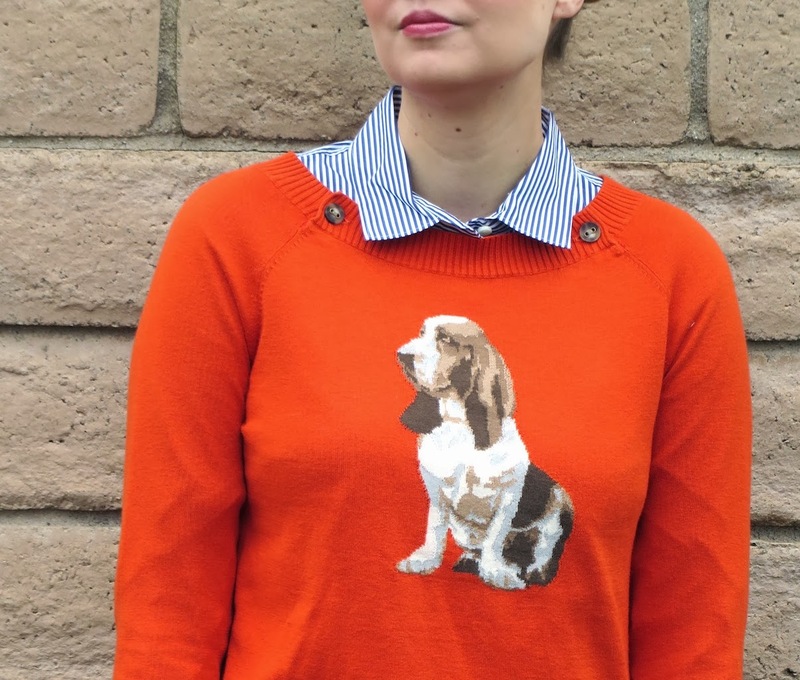 I'm not sure how I came across this Basset Hound sweater from Tommy Hilfiger. All I know is upon seeing the big Basset on the front I was sold. I secretly (okay, not so secretly) love Basset Hounds. Like the sweater, I'm not sure how this love affair with the breed began, but nonetheless I can't get enough of them. My husband and I talked for a while about getting a Basset Hound as somewhat of a foil to William. William is slim, whereas Bassets are, for lack of a better word, fat. William is fast and full of energy, whereas Bassets are slow and take their time with everything. Well, you get the point. For quite sometime we considered adopting an older Basset from a rescue organization with the intent of not only giving a loving dog a great home, but also we had the idea that maybe the more "mellow" habits of the Basset might rub off on William. While I might not have a Basset Hound (yet), for now this sweater will have to do. It's pretty cute if I do say so myself. I paired it with some Hunter rainboots to add to the English (French?) country feel of the ensemble. Chef, blogger and Basset owner Ree Drummond aka "The Pioneer Woman" has a funny blog entry about this sweater which you can find here here. What a fun sweater! I totally need to break my critter sweaters back out - tis the season! 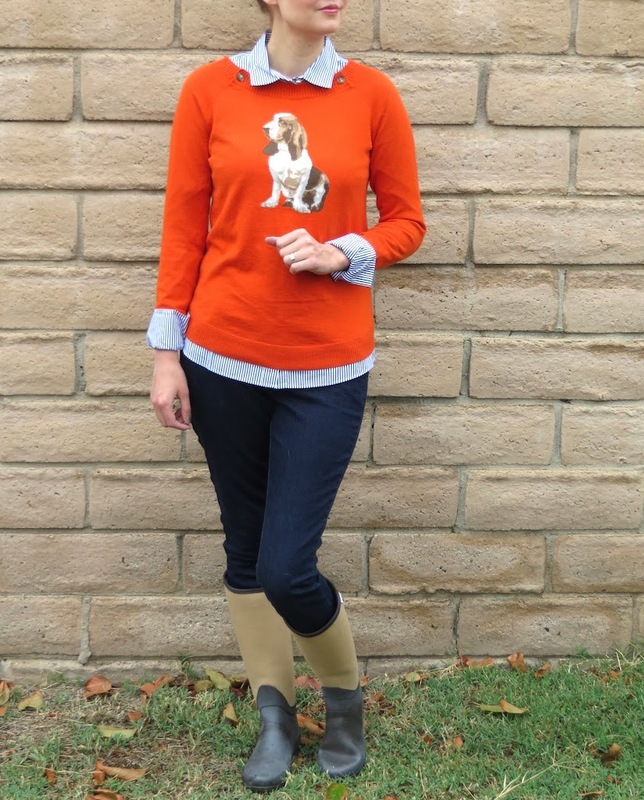 I LOVE this entire outfit - the basset hound paired with the boots is perfection! Thanks Laura! 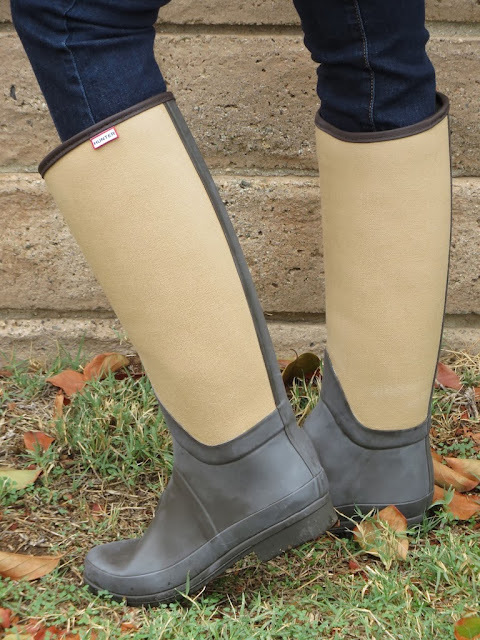 I thought the boots and sweater would be perfect for the equestrian type theme!